Your private guide will meet you at the arrival hall of Beijing Capital Airport. After a short greeting, the guide and driver will transfer you to check in at the hotel. The rest of the day is free for you to recover from jetlag and prepare for your following 4 weeks China tour. In the morning, we will guide you to the Tiananmen Square and Forbidden City, which are full of China's history. While enjoying the remarkable architecture, our guide will also tell you the related stories. At noon, you will enjoy an a la carte lunch (valued at CNY150.00 per person and included in our price) at a famous local restaurant. In the afternoon, you will visit the Temple of Heaven, a large park with a complex of ancient religious buildings. It was the place for emperors of Ming and Qing dynasties worshipped the Gods of Heaven. There you could also see many senior locals dancing, singing, playing cards or doing exercise. It is interesting to watch the local people enjoying their spare time. 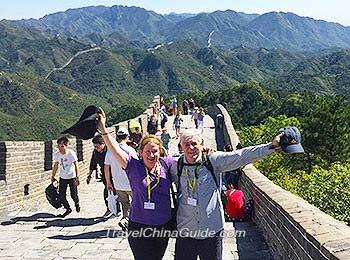 Round off your morning with an excursion to Mutianyu, a popular section of China Great Wall. The round-trip cable car is contained. Today's lunch is not included. You can have a fast food around the site or ask for your guide's advice. Before transferring you to the hotel, we will pass by the Bird's Nest (Olympic National Stadium) so that you can take photos, and then stop to visit a local market for a while. This morning, your private Beijing trip leads to the Summer Palace, a beautifully landscaped royal garden with amazing architecture. Then we will take you to explore Hutong area, a beautiful and original neighborhood of the old city, where you can feel the scent of old Beijing. You will also take a rickshaw through these hutong alleys. After visiting the 798 Art Zone, you will take a high speed train to Xi'an. Our local guide will meet you at the railway station and transfer you to the downtown hotel. 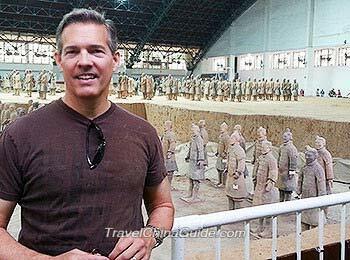 You must read about the warriors and see the pictures before you come to the Terracotta Army, but you will still be astonished by its dramatic scale when you look at the clay soldiers made more than 2000 years ago. Our guide will tell you more stories about this amazing wonder. After that, turn to the Provincial History Museum. The last stop today is the City Wall. With more than 600 years history, this city wall is remarkably well restored and accessible. It is also a spectacular sight when light up at night. It is worth renting a bicycle and ride around the broad ancient City Wall. We will arrange a morning flight from Xi'an to Lhasa for you. Upon arrival, our local guide will meet you at Lhasa airport and transfer to the hotel. We suggest you stay at the hotel to acclimatize yourself to the high altitude for the remainder of the day. Lhasa is the holy land of Tibetan Buddhism. 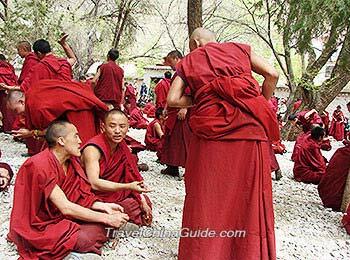 There are numerous historical relics and Buddhist monasteries. Today you will visit the Drepung Monastery, Sera Monastery and the Norbulingka Park, all of which have important positions. We believe you will be attracted by the lamas conducting colorful debates in the courtyard of Sera Monastery in the afternoon, even if you cannot understand anything being disputed. The highlight of your private Lhasa tour comes to the impressive Potala Palace. It gets visible from afar because of its 13 storeys built on the slopes of the mountain and also its gleaming white walls. It is an amazing experience reaching up to the top of Potala Palace to see so many locals walking piously along this magnificent ancient palace with their prayer wheels. After that, you will also visit the Tibet Museum, Jokhang Temple, Barkhor Street and a Nunnery. Our guide will accompany you all the way and show you a lot about Tibetan Culture. Today we will transfer you to Gyangtse with a stop-over at Yamdrok Yumtso Lake. This exotically beautiful landscape is a great photo opportunity. We believe you will enjoy the deep blue water, snowy peaks and blue sky. Once arrive in Gyangtze, you will also visit the Palkhor Monastery and Gyangtse Old Street. Today we continue to drive to Shigatse, where you will visit the Tashilhunpo Monastery and the New Palace of Panchen. You will see the world's largest gold gilded bronze statue of the Buddha Maitreya in Tashilhunpo Monastery. Continuing a long drive about 5 hours, we will get back to Lhasa. En route, you will visit a Tibetan family home. For the rest time of the day, you can rest at the hotel to recover from the fatigue of the trip. You will fly to Lijiang today and our local guide will pick you up at Lijiang airport and transfer you to the hotel. For the rest of the day, you will visit Lijiang Old Town at leisure. 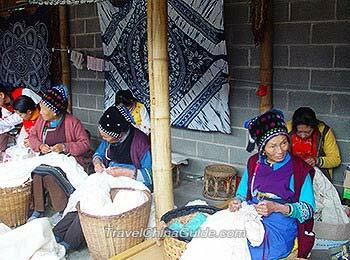 In order to know more about this exotic land inhabited with minority ethnics, you will be guided to visit the Baisha Village, a local Naxi family, Baisha Mural, Shuhe Old Town and the Tea-Horse Road Museum. The gorgeous Baisha Murals are housed in a temple complex. The murals are depicting the inclusivity of China's religion as they have features of Confucianism, Taoism and Buddhism. The afternoon is free for you to wander the curving old alleys, stroll along the banks of the numerous canals and take photos. Escorted by our guide, you will travel to Dali. It is about three to four hours driving. On the way, you will visit the Bai Traditional House in Xizhou and see the Zhoucheng tie dyeing. As the birthplace of Bai ethnic group, Dali has its own features on culture, tradition, food, dresses, etc. You will visit Erhai Lake Park, Three Pagoda Temple and Dali Old Town today. After that, you will take a bullet train for 2 hours to Kunming. Our local guide will meet you at the railway station and transfer you to the hotel. After breakfast, we will head to visit the breathtaking Stone Forest. Although it is all stone, each of grotesque formations seems to have a character of its own. Then you will take a flight to Guilin. 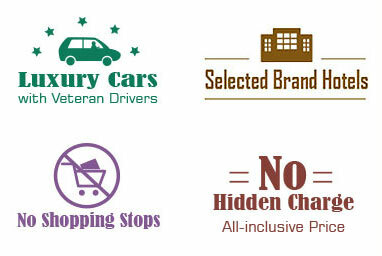 Our local guide will meet you at the airport and transfer you to the hotel. 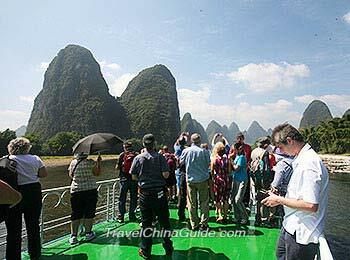 Today our guide will accompany you to take the Li River cruise down to Yangshuo. The 50 miles Li River is surrounded with beautiful karst mountains. On the way, you will find wonderful scenes in every corner and it is a great backdrop for photos. After the 4 hours cruise, you will have a countryside trip in Yangshuo. We also arrange a local family home visit for you. Most people find it interesting to see local farmer's house and life. After the whole day tour, you will stay at the hotel in Yangshuo. The morning is free for you. We suggest you rent a bicycle and ride around Yangshuo County to enjoy the beautiful landscape. You could visit the Yulong River, Moon Hill or Ten-Mile Gallery. After that, our guide will pick you up and transfer you to Guilin. For the rest of the day, you will visit the Reed Flute Cave and the Elephant Trunk Hill. You will take a morning flight to Chengdu. Our guide will meet you and transfer you to the hotel. Rest of the day is free for you to explore this vibrant city. 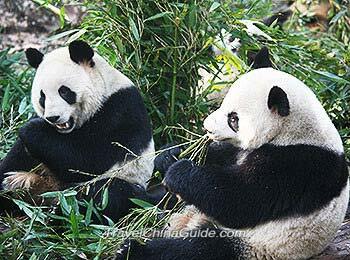 The main aim for most travelers coming to Chengdu is to see pandas, as Chengdu is the hometown of giant pandas. Today, you will visit Chengdu Research Base of Giant Panda Breeding. We will take you there earlier as pandas are more active in the morning during the feeding time. If you are lucky, you may watch the cute baby pandas. Then you will visit the Broad and Narrow Alleys and Jinsha Site Museum. Morning is free for your individual activities. Then you will take a bullet train to Chongqing. Our local guide will pick you up at the railway station and transfer you to the pier to board the Yangtze River cruise ship. It will sail at around 22:00. 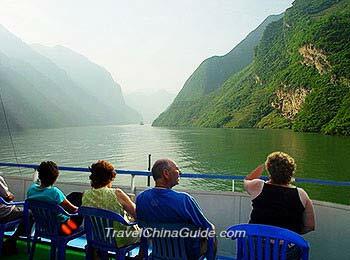 The three days Yangtze River cruise is a relaxing journey through your one month China itinerary. You can appreciate the spectacular scenery of the gorges, take photos, or enjoy the sunshine on the deck leisurely. The cruise company will also arrange some onshore excursions each day. This afternoon, you can visit Shibaozhai, where you will see an ancient wooden pagoda with total 12 storeys. The view at the top is very beautiful and worth of your effort to climb up. Around 20:00, the Captain's Welcome Party will invite all the guests to participate. Today the cruise ship will sail through the Qutang Gorge, Wu Gorge, and Xiling Gorge, the most beautiful sections of Yangtze River. Prepare your camera and capture the stunning landscape. 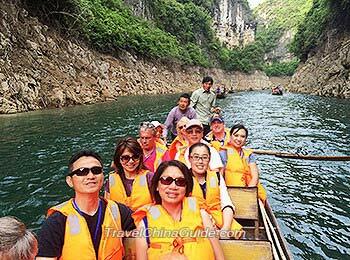 The river guide will also point out the main attractions along the gorges. 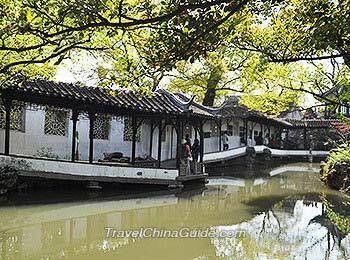 In the afternoon, you will change to a smaller wooden boat to have an excursion to Shennong Stream. Please pack your luggage and check out of the cruise ship after breakfast. Then you will have an onshore excursion to the Three Gorges Dam. It is the largest dam in the world. There is an advantage point where you can see this entire complex. When visit is over, the ship company will transfer you to the Three Gorges Tourist Center in Yichang. And our local guide will pick you up and transfer you to Yichang East Railway Station for a 7.5-hour bullet train to Shanghai. In Shanghai railway station, our guide will meet you on time and transfer you to the hotel. After breakfast, you will visit Shanghai Museum first and then turn to Yu Garden, a traditional Chinese garden, designed in the 16th century. It is so beautiful with magnificent rocks, pavilions, ponds, bridges, trees and residence that you will feel it a true respite in such a busy city. An a la carte lunch (valued at CNY150.00 per person and included in our price) is arranged at a fancy local restaurant. 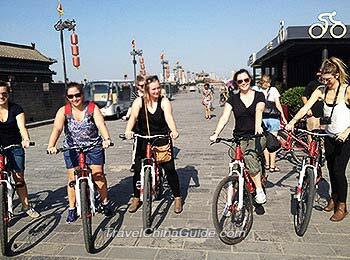 In the afternoon, we schedule the Bund, Huangpu River cruise and an ancient cultural street for you. Transfer you to the railway station and you will take a morning high speed train to Suzhou. Our Suzhou guide will meet you at the railway station and take you to visit two famous classical Chinese gardens, like Humble Administrator's Garden and the Garden of the Masters of the Nets. Later visit the Pingjiang Road. After finishing the sightseeing, you will take a high speed train back to Shanghai. Our local guide will wait for you and transfer you to the hotel. You must have a solid overview of Shanghai until today. However, Shanghai has a lot on offer as it is a renowned city of history, culture and tourism. So we leave the whole day at your disposal. The following is our suggestions for your self-service exploration. In the morning, we suggest you go to the Jade Buddha Temple. You could take the bus No. 13 at Tianmuxilu station near Pullman Shanghai Jing An Hotel and get off at Changshoulu station after 13 stops. From the Golden River-view Hotel, you could take subway No. 13 at Hanzhong Road station for one stop, get off at Jiangning Rd. station and walk to the destination. The sitting jade Buddha and recumbent Buddha in this temple are really striking pieces. It is hard to imagine how such large jade stones were carved. Then you could take Subway Line 13 at Jiangninglu Station and change to Line 2 at Nanjingxilu Station. Finally get off at Lujiazui (Exit 6). You will arrive at the Lujiazui Finance and Trade Zone of Pudong. It is the largest financial zone in mainland China, and there you could find Oriental Pearl TV Tower, Jin Mao Tower, Shanghai World Financial Center and Shanghai Tower. You can visit one of them or just spend your whole afternoon there. After that, you may spend your time shopping in the nearby Nanjing Road. As our guide transfers you to Shanghai airport for the flight to Hong Kong, your private guided tour is completed. In Hong Kong, we prefer to leave all the activities on your own except for the hotel accommodation with breakfasts, as the private guided tour in Hong Kong is high priced. Hong Kong is pretty easy for self-service explorers. English is widely used and the transportation system is also very convenient. You can take the Airport Express to get off at Kowloon station and then connect to the free shuttle bus K3 to Regal Kowloon Hotel or K4 to the B P International House. 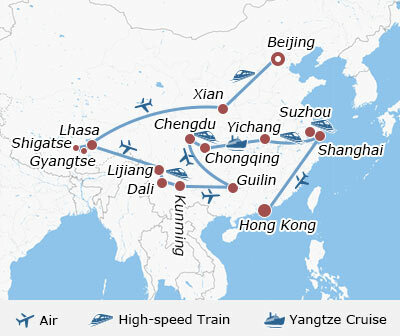 There are also high speed trains available between Shanghai and Hong Kong with a duration of around 8.5 hours. If you prefer to experience the high-speed train instead of flight, please contact your travel consultant directly. You have the whole day to explore the vibrant Hong Kong on your own. The hotels we arranged for you both are conveniently located in Kowloon. They are just within easy reach of the MTR underground. The first site we suggest for this morning is the Victoria Harbor. If you stay at the Regal Kowloon Hotel, you could walk westward along the Mody Road and turn to left at Chatham Road South, finally get to the waterfront of the Victoria Harbor. If you set off from the B P International House, you could walk westward along the hotel's Austin Road and turn left onto Canton road. Continue walking southward until to the Salisbury Road and finally turn right. Later you could take the Star Ferry at the nearby Star Ferry Terminal to Central on Hong Kong Island. Near the pier, you will find the Bus No. 6, 6A, 6X, 60, and 260 on the Exchange Square. Get on one bus to Stanley, where you can visit the interesting Stanley Market. There are many restaurants, so you can choose one to have your lunch. After that, we suggest the Victoria Peak for you, where you could get a panoramic view of Hong Kong. You can take CityBus No. 6 to Bowen Road, Stubbs Road Station and then transfer to Bus No. 15 up to the Victoria Peak. In the evening, take a Star Ferry back to Victoria Harbor to watch the wonderful A Symphony of Lights at around 20:00. Today you will go to the airport and take your homeward flight on your own. You can take a taxi to the airport directly. Or take the free shuttle bus K3 or K4 and connect the Airport Express at the Kowloon station. Wish you a nice trip back home! How much will it cost for a taxi from Capital Airport to 68 Chaoyang North Road 13层1304, Beijing Shi, China? Generally speaking, the cab fare is CNY80 to 90. How much would it cost to get from PEK airport to Crowne Plaza Beijing Wangfujing via taxi? What about metro? Also, is it safer to pay cash (CYN) or use Credit Card? It costs CNY90-100 by taxi. Instead of metro (at least two transfers), you are suggested to take shuttle bus line 13 to Wangfujing Street and then walk north for 2mins to your hotel. It costs CNY25. I don't think credit card can be used, you'd better prepare some cash. I will arrive in Hong International airport at 12.30 on the 19th Jan, 2018 and from there go to the hotel in Guangzhou. May I know What is the fastest and convenient transport. I am a Malaysian with multiple entry visa to China. Well, you can take a ferry at 15:20 to Lianhuanshan Port, Guangzhou. It takes about 100 minutes and 300HKD. After that, take a taxi to Haibang Subway Station. Then, take subway line 4 and transfer to line 8 at Wanshengwei. Do another transfer to line 2 at Changgang, and get off at Yuexiu Park. Leave from Exit D1/D2, you will see the hotel. Thanks for the reply and the recommendation. However, I thought that was a complicated way by ferry + taxi + 3 times MRT transfer before arriving at destination. I was cheated twice when travelling by taxi in Guangzhou and I don't think I would take taxi anymore if I could help it. I understand there is a couch/bus service with direct connection from Hong Kong airport to Guangzhou city ? I also gather that there is one type without having to change to another at the immigration ? Look forward to your further reply. Yes, there is a direct bus to your hotel, and it takes about 3h 30 minutes, 250HKD. Follow the signs, you can find the bus station easily. Also, you can turn to the staff for help! Have a nice trip! We are US citizens flying from the US to Shanghai. 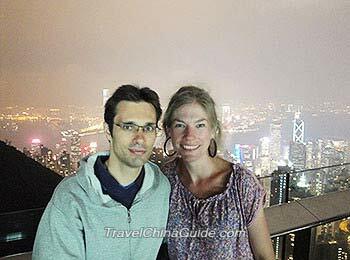 We stay 2 days in Shanghai and leave by cruise ship to Japan, Hong Kong, Vietnam and Singapore. We leave Singapore and return to the Unites States. Do we need a visa to enter Shanghai? No visa is needed for your case, because you are eligible for 144h visa-free transit. Do fill in the "Embarkation/Disembarkation Card" before landing, and apply for a stay permit at the immigration counter when getting to Shanghai. Does the bus from Xinnanmen, Chengdu to Bipenggou has storage space for luggage bags of 2 adults? Yes. There are luggage rack above the seats for you to put your carry-on baggage on the coach. Besides, the large storage space is also available under the coach for large bags. As for the bus tickets, you can purchase the tickets on the spot or find a local agent to book the tickets for you in advance.